Get all-day help on your home screen. See your upcoming activities and commute at a glance. Plus, get recommended videos, view recipes and timers, and explore what your assistant can do. 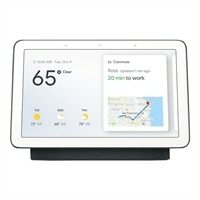 Google Home Hub - Smart home control system - wireless - 802.11b/g/n/ac - CharcoalGet all-day help on your home screen. See your upcoming activities and commute at a glance. Plus, get recommended videos, view recipes and timers, and explore what your assistant can do.